My adventures in homebrewing beer. Just a quick update on my homebrewing adventures. Finally got around to doing my first AG brew using my new mash tun, using the Northern Brewer Bavarian Hefeweisen kit. The crushed grain sat in my garage for a couple weeks, then got tossed into the kegerator for storage for the next 4-5 months. Hopefully the grains didn’t go stale and affect the flavor of the malt. As this was my first AG experience, I had a slight hurdle with the volume of the strike (?) water. I was attempting to do the more complex multi-step protein/saccharide rests, and may have started out with far too much water. Thus I ended up with about 9 gallons of liquid that needed to be boiled down to ~5. I still don’t fully understand what grain/water target ratio I should be using at mash-in. Needless to say, I burned off a good amount of propane just boling off those 4 gallons of excess liquid. I’m unsure of how to properly calculate mash tun efficiency, however what I do know is that the listen target for original gravity was 1.049, and I ended up with 1.046. I was hoping for higher, as I did rinse the grain pretty well (or so I thought), and by comparison, my experience with the extract version of this kit has resulted in an OG of as high as 1.052. The comparison might not be valid though. Fermentation was very active, as usual, finishing up it’s frothy activity within the first 36-48 hours. This time around I didn’t have any issues with blowoff. So, with any luck, I should have a perfectly drinkable beverage in just under 4 weeks. Now to figure out where to re-fill my 10# CO2 cylinder. I picked it up at my local Menards for about $30. You should be also able to find them at Walmart for about $40. 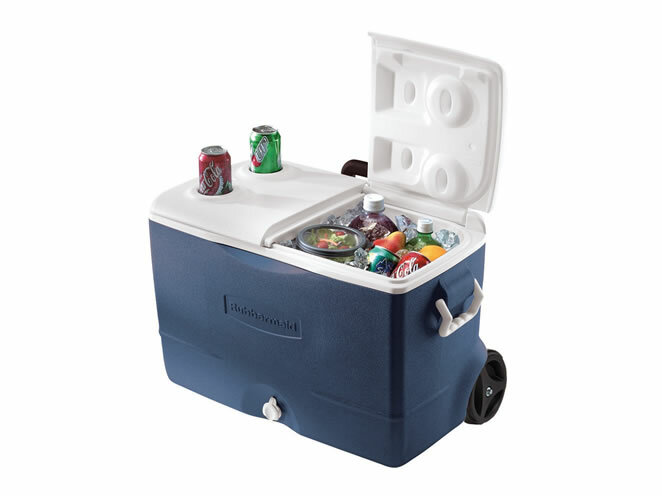 I chose this cooler because I’ve purchased a few of them over the past years, so I know they’ll likely be making them for a while. Also, the design is relatively easy to build a mash tun manifold for. And, according to this chart, I should be able to make up to 10 gallons of wort comfortably in there, allowing me to eventually make double batches. The manifold is a design that I came up with, and eventually I’ll get around to actually measuring and posting dimensions of the piping so you can build one too. I used under 8′ of copper pipe for it, and should have enough length left over to eventually build a fly sparge manifold (or at least a start on it). 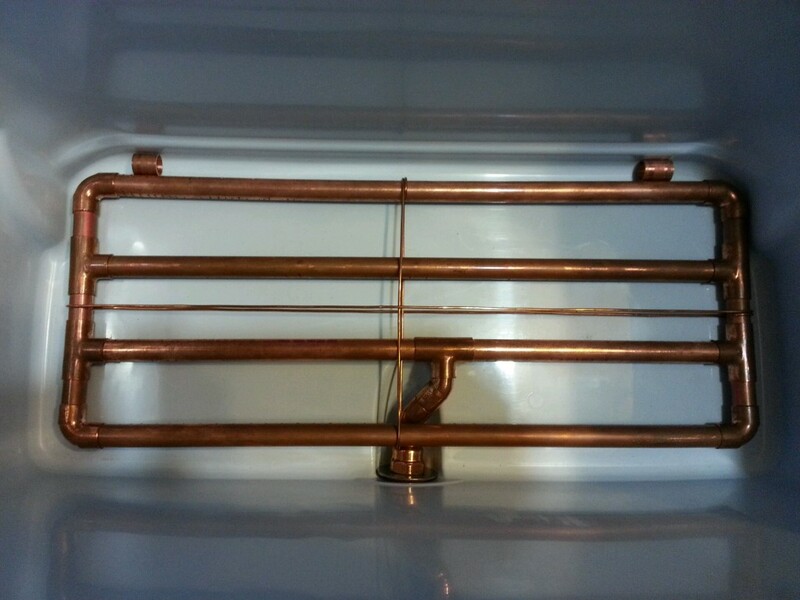 The design relies on two lengths of bare copper wire to hold the whole thing together, and two small segments of tubing at the back of the cooler keeps the manifold securely wedged in position. I’m not averse to soldering, or even all that concerned about contamination from the silver-based solder. My main reason for going solderless is to make it easy to clean. I can literally disassemble the entire manifold into individual components, ready for a thorough brushing if desired. My wonderful wife got me a Northern Brewer Deluxe Brewing Starter Kit (Glass) a couple of Christmases ago, and I’ve been slowly expanding my “brewery” ever since. I’ve made maybe 6 batches of beer using the kit. One of which I royally messed up (NB Bavarian Hefeweizen) when I scorched the malt in my newly-keggle-fied boiling vessel (on high heat of course). Anyhow, I expect to be posting updates on future brewing exploits, so to kick it off, here’s my 6th-ish brew: the Northern Brewer Nut Brown Ale (extract kit). This is video I took of the fermentation just a mere 24 hours after directly pitching dry yeast into the wort. Not bad I think, considering that Danstar recommends prepping the yeast before pitching it.